Egg yolk colour – feed or breed? I’ve been raising hens for about 18 years. I love their eggs so much that I don’t think I could eat eggs from anywhere else. I’ve often been asked why my hens’ eggs are so much better than store eggs. So I got to thinking. Are they better because my hens have access to bugs and pasture and compost? I also don’t use commercial layer ration to feed them. I order in whole grains and mix them myself. This way the grains don’t go stale and I know exactly what goes into those hens (no oil or vitamins or animal byproducts). 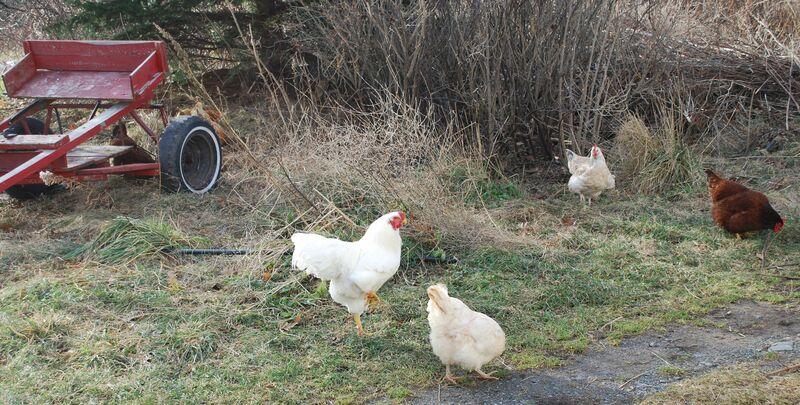 We used to mix and grind the grains with a bicycle-powered grinder (Bell 60), but I realized the hens have grinders in their little bodies (their crops). 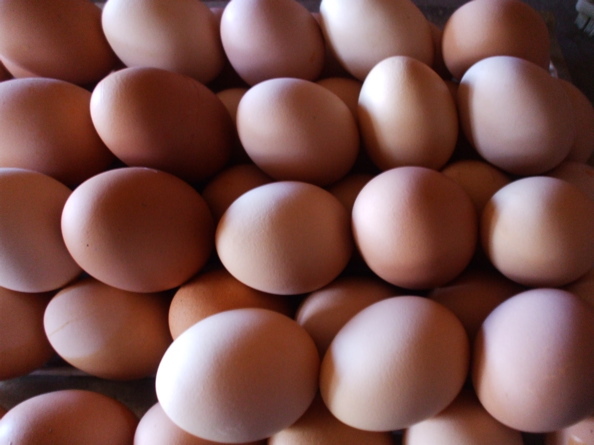 When I stopped grinding, the hens kept laying beautiful eggs, once they got used to the new feed. They just need access to grit or small stones they ingest into their crop, and the crop grinds the grain. I also used to think the hens needed a high protein element in their feed, like soybeans or peas or alfalfa. So I started to reduce these, and lo and behold, they kept laying beautiful eggs. 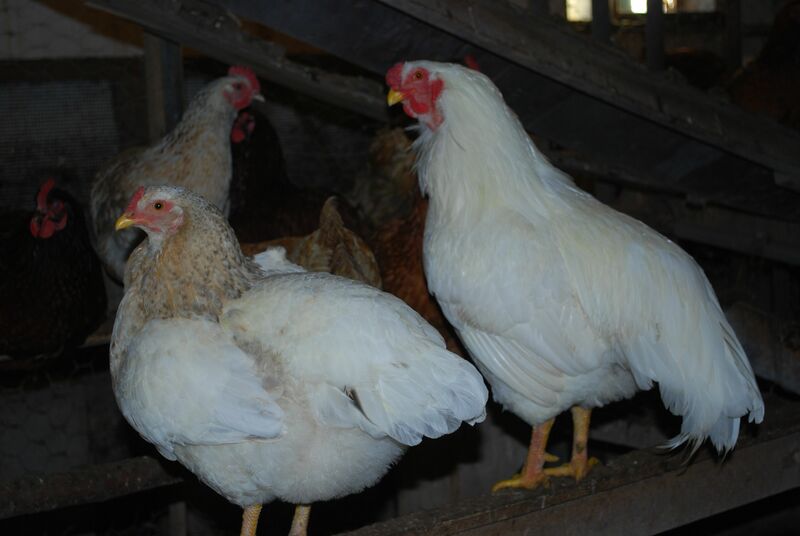 They are not champion high-egg layers, but they lay about 2 eggs every 3 days. I think the only reason we can play around with the feed like that is because the hens are so good at getting their own grub. Literally. They find bugs and grubs and clover and earthworms. They even eat compost… I don’t know exactly what they are eating in the pile, but they sure peck and scratch at it a lot. And that makes beautiful fine compost too! 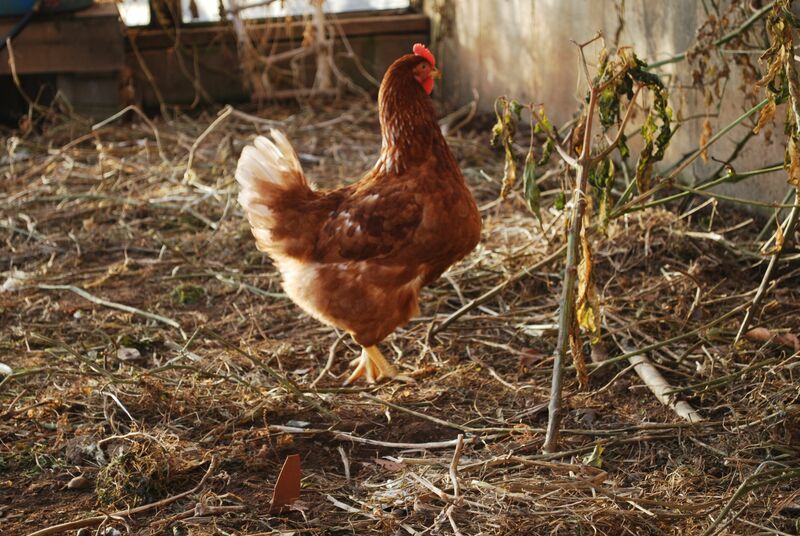 So the hens — let’s call them Jen’s Hens — have been selected over the years to be hardy and good at foraging for food. 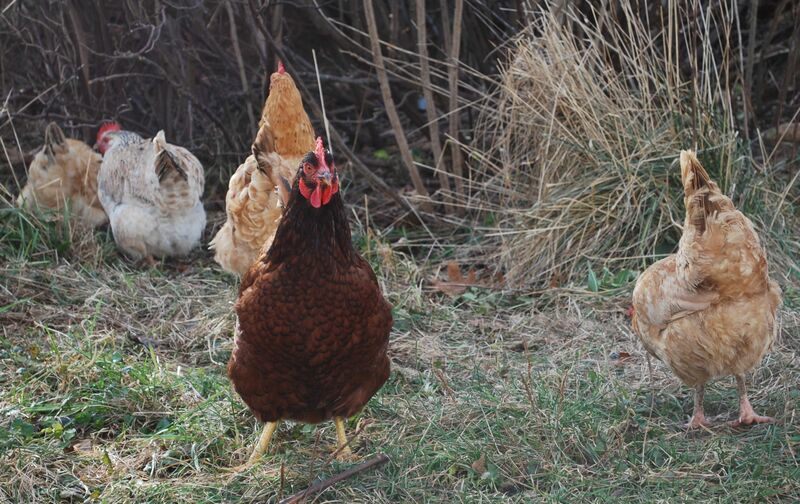 I’ve used heritage breeds such as rhode island red, buff orpington, black australorpe, barred rock, and white rock to make my own special combo breed by bringing in a new rooster every year. In 2010 I finally found a chanteclair to add to the mix. Chanteclairs are the original Canadian hardy breed, and they are pure white. To restate the question, are the eggs better because of the feed they get, or is it the breed? Recently I read an article by Joel Salatin about whether we should be saving heritage breeds of chickens, or focusing on selecting chickens that are particularly good at foraging outside for their own food. He suggested the selection program should be based on egg yolk colour. Apparently dark yolked eggs are laid by hens that are good foragers. Maybe I’ve done just that, by accident. But I still have the question. 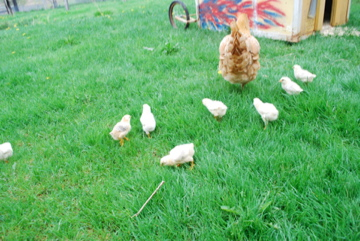 This year, instead of hatching my own chicks, I bought in 30 red hybrid layers from Scotian Gold Co-op. A very serious departure from my home-grown, frugal way of operating! The good news is, when the new layers started to lay, I could compare their eggs to Jens Hens eggs. It turns out their egg yolks were not as dark orange as Jens Hens’ eggs. Check out the photo for a comparison. It will be interesting to see if the red hybrid layers’ egg yolks will get darker over time, or if they will stay light. Luckily, their egg shells are much darker brown than Jens Hens eggs so I can tell them apart and keep comparing. One final observation. I think good foraging can be learned. When the hybrid layers first arrived, they were NOT interested in going outside or even scratching around in the coop. But since I put them right in with Jens Hens, they watched and copied. After about 3 weeks, they tentatively went outside and started scratching around. Now they are everywhere, exploring, and getting into all kinds of trouble. But I was mighty satisfied when one morning I let everyone out and the new hybrids were found, heads down, madly eating short grass outside the barn. I’ll keep you posted. This entry was posted in hens and tagged breed, chickens, eggs. Bookmark the permalink. 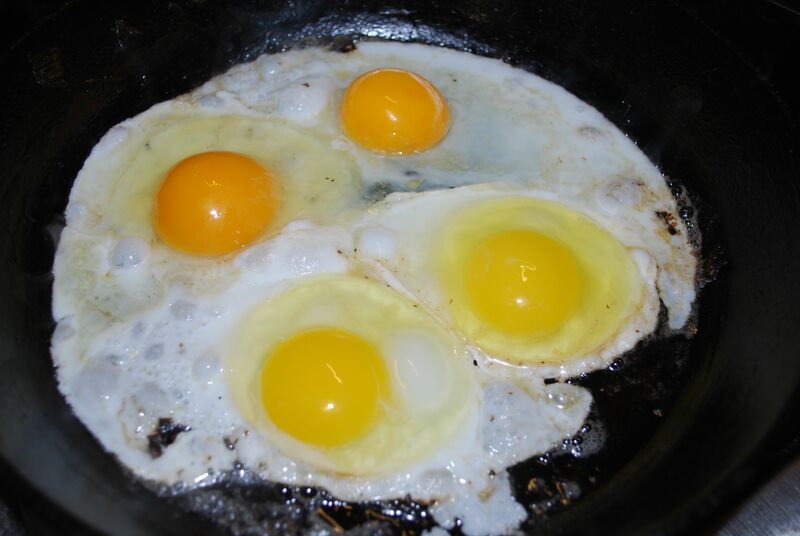 6 Responses to Egg yolk colour – feed or breed? Interesting study. Keep us posted. I was perusing Eating Animals by Johnathan Safran Foer and read that it’s actually quite hard to get a hold of heritage strains of poultry, and that because factory boiler hens are incapable of reproducing and raising their own young it is more important than ever to preserve heritage birds. Are they as hard to get a hold of as Foer suggests in your experience? It is challenging to find good specimens of heritage breeds. You can’t go to a store and buy them. Once you’re in the heritage chicken network, it gets better. And Kijiji helps too. If you want to spend money, there is Murray MacMurray hatchery in the States (www.mcmurrayhatchery.com). I thought about mixing my own layer ration but found it overwhelming with all the info on the web. Would you mind sharing your layer ration recipes? Where do you buy the grain from? After years of experimenting, I came up with a very simplified mix: wheat, corn, and barley in roughly equal portions. But I’m always adjusting according to what grains I can buy locally. I also add a handful of kelp meal and oyster shell. The best feed I’ve ever had for layers was from an organic people food mill (Speerville Mills) in New Brunswick. I took a lot of their undersized cleanings, which included weeds. I think the only reason I can get away with my simple mix is the amount of feed the hens get on their own in the compost heaps and pastures. That’s quite a difference between the color of the hybrid layer yolk and the Jen’s Hens. Did they darken up after they learned how to forage or stay the same color?